This training offer includes the Train the Trainer Kit ($366 value) with the Train the Trainer training class at one of our training locations. This offer is the ideal solution for a company looking to establish a forklift safety program utilizing its own staff member as trainer for the employees. The program is tailored to providing the education and materials required for an individual with experience working on the shop floor or at the warehouse location and who is familiar with the forklift equipment the employees are operating to become a trainer for the company. The Train the Trainer Hands on Class. This training class was created for companies looking to develop a forklift training program in house. The class provides a company’s trainer with additional training and certification for forklift operations to ensure the trainer and company are in compliance with OSHA regulations. The trainer will receive the OSHA compliance photo ID Trainer wallet card with name and certification date which is valid for 3 years. A certificate of achievement can be printed immediately upon completion of the training. The trainer should be able to train UNLIMITED number of employees every 3 years using the same materials for many years to come. Additional wallet cards can be purchased at our online store. 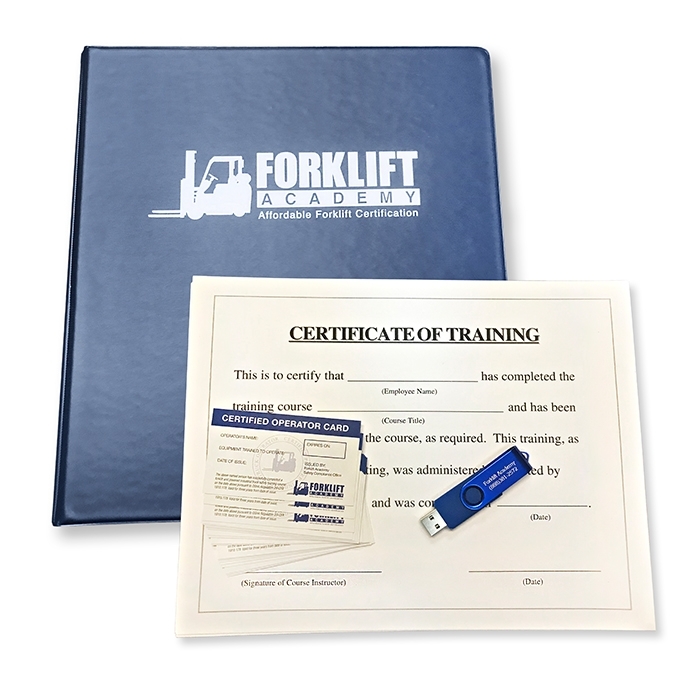 The Train the Trainer KIT ($354.00 +$12 shipping) is a complete OSHA compliant Forklift Certification Training Kit. 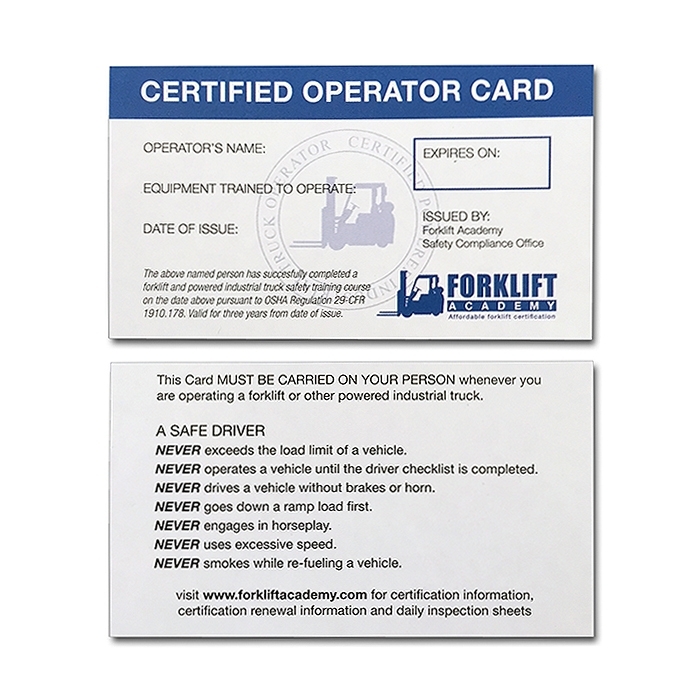 It includes a USB power point presentation, a free Forklift Operator Training USB, an instructor guide, new OSHA regulations information, forklift compliance and operator guide, daily inspection checklist, attendance sheet, written and driving tests, 20 certificates and 20 wallet cards. Is this forklift training option right for you? The purpose of the Train the Trainer KIT is to be used by Companies to train their employees and its affiliates. Due to Copyright laws the KIT can not be used by Consultant Companies offering Forklift Safety Training or any other individual, person trying to benefit financially with these Copyright and Trademark materials.